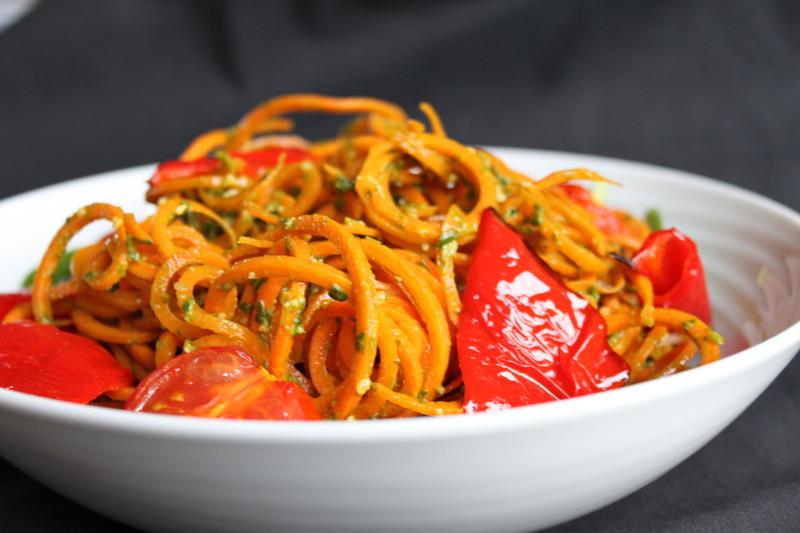 If you don’t have a spiraliser you can still make this recipe using a ‘Y’ peeler, the ‘noodles’ will be thinner but it will still be a great dish. I use homemade pesto (recipe here and here) as I’ve normally got some in the fridge but you can use store bought pesto too. 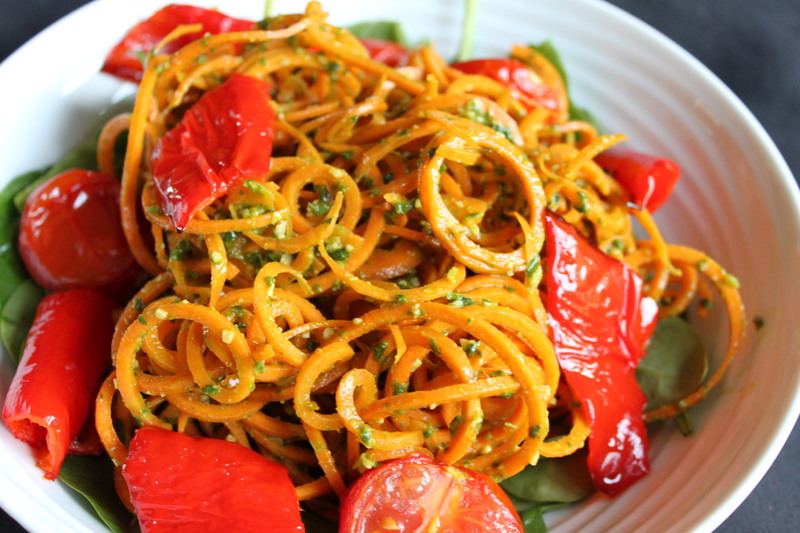 In a large bowl combine the carrot noodles and the pesto. The best way is to mix with your hands to evenly distribute the pesto. Place the spinach leaves on a plate or in a serving bowl, top with the pesto carrot noodles and then add the pepper and tomatoes if using. Loving your blog and your gorgeous recipes, very inspiring. Bravo! 1. Do you not need blanch the carrots to soften them? 2. I’ve been meaning to get a spiralizer for a while… Any suggestions as to a good one? Lovely to hear your feedback on my recipes, delighted you like them! I normally don’t blanch any veg I’ve spiralised, however, if I’m having spiralised sweet potato or carrot with a warm sauce (ie bolognese) I add the spiralised veg to the sauce just before serving to warm them through. I got my spiraliser from amazon, it’s the Spiralite Vegetable Spiraliser, I’ve had it for a couple of years and use it weekly and it’s lasted well!